1 What are Guild Expeditions? Guild Expeditions is a cross-platform cooperative feature where you and your guild mates forge your way through a number of locations to acquire personal rewards and guild power. Expeditions begin automatically every Tuesday and last for 6 days. 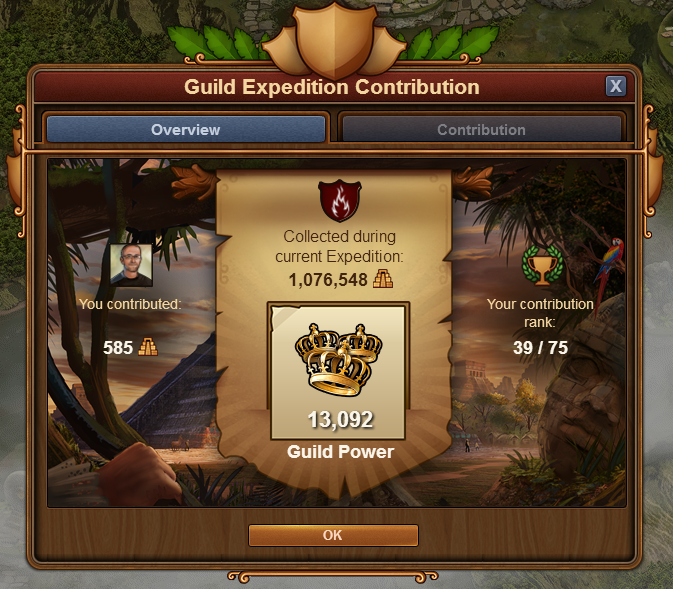 Every player who is a member of a guild and has reached the Iron Age at the time when an Expedition begins, can contribute to the success of their guild by participating in the ongoing Expedition. You can access Guild Expeditions from the game's menu buttons. If you join or create a guild when the expeditions have already started, you will have to wait till next Tuesday for a new Expedition to begin. The map as you can see has a jungle-theme setting, and is accompanied with similar music. Every player in the guild will have their own individual map to complete, but you all share the same goal bar at the top of the screen (or at the bottom, if you play via our mobile app). The goal bar counts the Expedition Points your guild has collected, and whenever you reach a new goal your guild will win guild power. The power for your guild will be paid out each day, when the daily recalculation takes place.You can click on the bar to view more details. Expedition points come from the the main item you'll notice on the map - the various locations (called Encounters). These can be solved either by fighting or via a negotiation game. Whenever you solve an encounter you will also be able to collect a personal reward from the chest after it, and move on to the next encounter. As you progress further, the fog from the map will also be lifted, revealing additional encounters and chests. Be aware that the 'larger' encounters will always be more challenging than the 'smaller' ones. If you've gotten lost on the map the golden arrow will point to your current spot! When you run out of them, you can either wait for them to regenerate (you get 1 per hour) or buy them with medals (or Diamonds). The medals price for each attempt will rise as you purchase more. At the end of the Expedition the cost will reset, so you will have a fresh start each week. Regardless of the outcome of your attempt, you will contribute some expedition points to the guild progress bar (obviously if you lose, it won't be that much). The guild goals depend on the number and era of the guild members (these are set when the expeditions begin, they will not change even if you gain or lose guild members over the week) and are shared between all guild members. 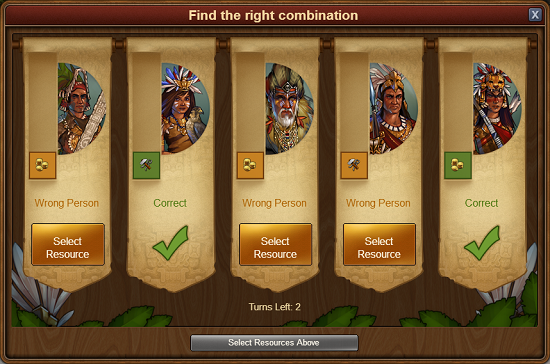 As we mentioned, you can solve encounters in one of two ways - fighting or negotiation. Fighting should already be known to you, because it is the same as everywhere in the game (the Continent Map, PvP, and GvG). The units' age and the overall difficulty of the encounters depend on your own advancement in the tech tree when the expedition begins. 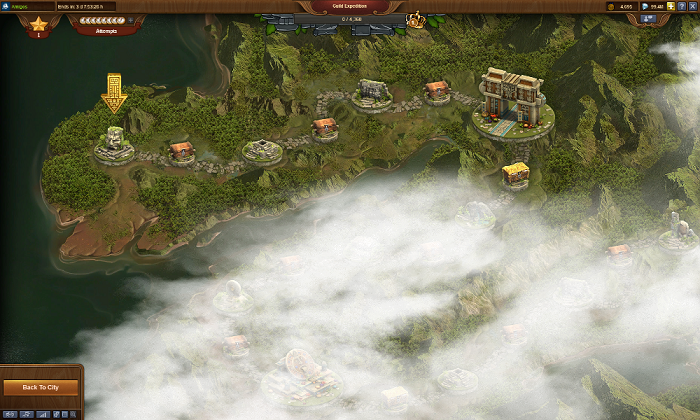 You may also face two-wave battles, as well as units with boosted attack/defense depending on your own era. Correct - your offer was accepted! However, other locals may also want this resource (though not necessarily). Wrong Person - your offer was rejected. But at least one other local is searching for this resource! Incorrect - your offer was rejected, and no local needs this resource (it will also be grayed out in the resource selection window on your next turn). Once you've spent all 3 turns, you can only buy a turn with diamonds or give up the attempt and come back at a later time. If you decide to give up and try again later, the set of resources you can choose from will remain the same, but who wants what among the locals will be randomly changed. As you can see, the default difficulty is I and it's available for free. 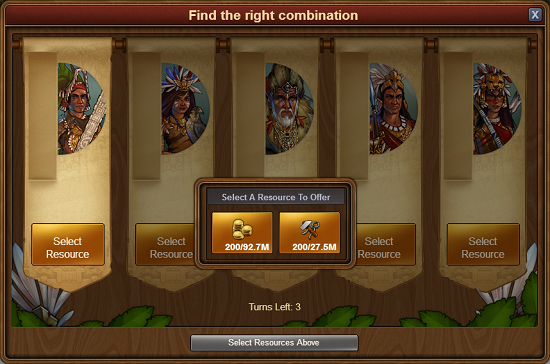 To unlock the higher ones, a guild leader or founder has to pay goods from the guild treasury. But everyone can donate the goods to the guild treasury, only spending them is limited to leaders/founders. The Costs of Unlocking Difficulties depend on the age and number of your guild members when the expedition begins. Each player in your guild will generate a cost based on their age. 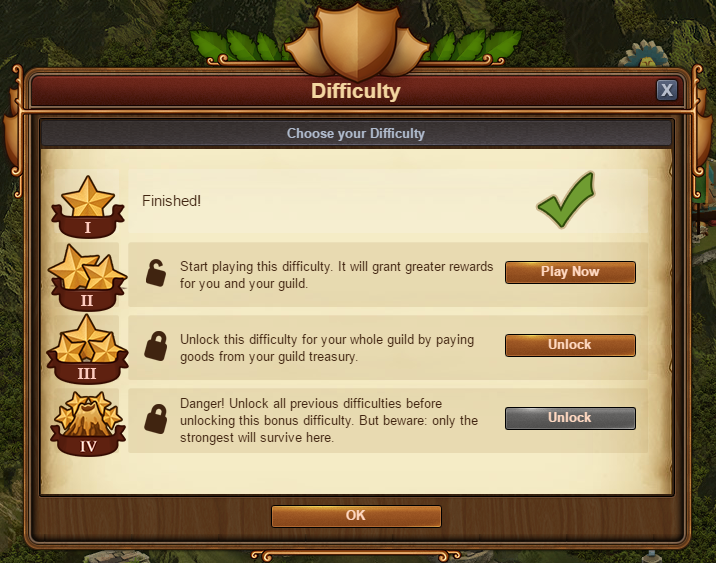 Your guild will need to pay the cumulative cost for all guild members in order to unlock the difficulty. Unlocking a difficulty makes it available to all guild members who are taking part in the current Expedition. The Guild Championships take Expeditions to another level, and allow for cross world competition! The Temple of Relics is a Great Building designed specifically for fans of Guild Expeditions. You can get blueprints for it either by solving encounters in expeditions, or by contributing to the same Great Building in cities of other players. It has only one passive bonus - the Relic Hunt ability. Relic Hunt gives you a chance to find special rewards whenever you solve an encounter in an expedition. You will locate an icon on the right hand side on the expedition map - when it's highlighted it means there is at least 1 relic on the map that you can collect. If a relic is under a fogged area, you will need to progress on the map for the fog to disappear so that you can collect the relic. Make sure you collect any relics before proceeding to the next difficulty as any uncollected relics will disappear! The rewards come in 3 groups, each of them a different type of relic - common, uncommon, and rare. Of course the chances are higher to get a common relic, and lower to get a rare relic. But this changes as your Temple of Relics levels up - the chances to win a rare relic will increase with each level, while the ones for a common relic will decrease. Here is an overview of what rewards these relics can give you, and the respective probability to win those specific rewards. This page was last modified on 13 August 2017, at 23:46.